I remember when I first tried icing cupcakes and had to search for an instruction as to how exactly it works. 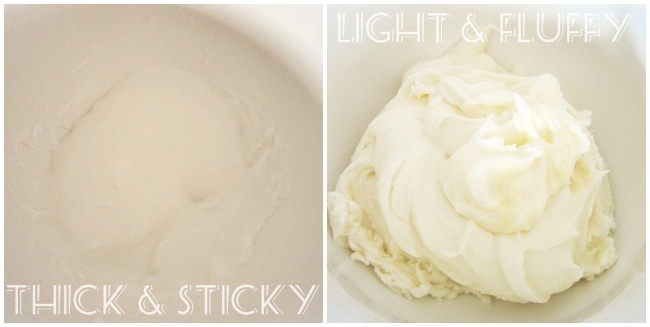 To spare you the time of browsing the web, I thought I'd share my newly gained knowledge with you and do a 'How To: Cake Icing' for you. 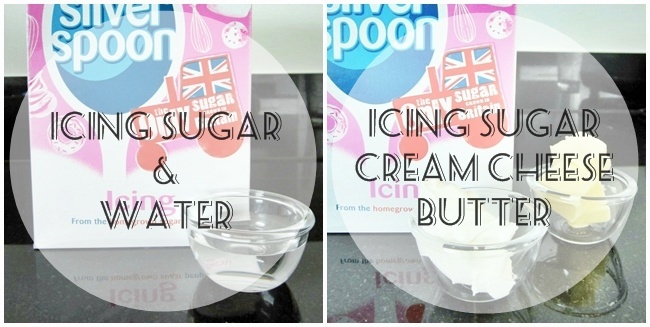 There are 2 very common ways to ice a cake, cookies or cupcakes: 1) icing sugar & water 2) icing sugar, cream cheese & butter. Both can be used in combination with food colouring, sprinkles, glitter or any other type of decoration. Here you'll need 2:1 (tablespoon measurements) e.g. 4 heaped tsb icing sugar + 2 tsb water (not heaped, but I wouldn't know how to do that with water anyway). Icing sugar can absorb a load of water so sometimes you'll need more and sometimes less, also depending on whether you add liquid food colouring. The mixture is 1:2:10 (scales) e.g. 20g butter + 40g cream cheese + 200g icing sugar. I usually hand mix the icing sugar and the water because it can get quite dusty if there's too much power behind the mixing. As for the recipe, I often add a little sugar into a bowl, pour a little water over it and gradually beat in the rest of the sugar until I have sticky icing, adding water if necessary. 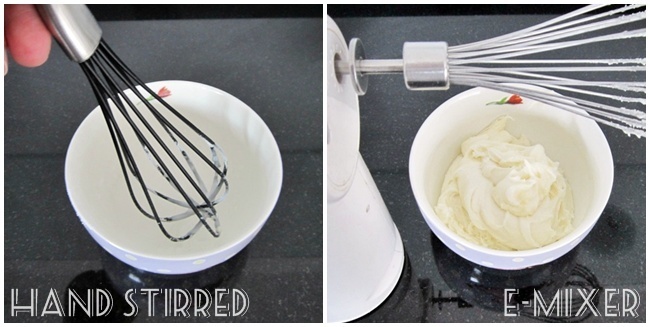 To get the buttercream icing really fluffy and creamy, I usually use an electric mixer because the butter can be a bit tricky to beat if it's even a little hard. As for the procedure, add the butter into a mixing bowl and beat until fluffy. Add the full fat cream cheese and beat again until light and fluffy. Gradually add the icing sugar until you have a well combined icing mixture. Info: Often it says butter should be at room temperature which doesn't mean that it should be super-softy-melty but just soft enough to give in to a little pressure. This is what it usually looks like. #1 is pretty thick and sticky but dries really quickly and hard in the fridge (and outside of it) and is probably the better option if your cake or cupcakes have to travel somewhere with you; #2 is light (not in the sense of few calories) and fluffy but usually gets hard enough in the fridge so you can dip your finger in it without breaking its swirls. The water + icing sugar mixture is best applied with a baking brush or the backside of a teaspoon. If you have an entire cake to ice, I would probably use the brush because even if you an see little brush strokes at first, they usually melt away. Sprinkles, glitter or any other decoration needs to go on right away. 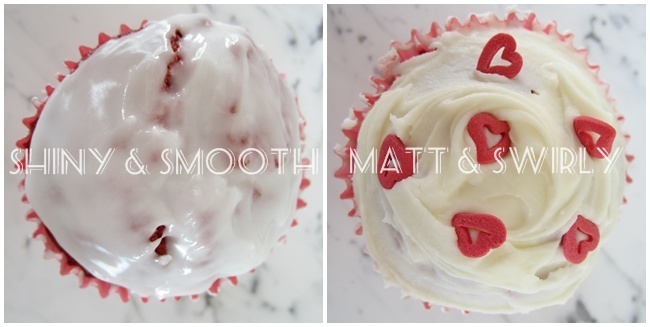 There are a number of way of how to apply buttercream icing onto a cake or cupcake. For cupcakes I prefer using the backside of a regular kitchen knife, but a piping bag with different nozzles for pretty swirls also works fine (more difficult to clean afterwards though). You have a little more time to add decorations here, particularly if the cakes aren't refrigerated right away, but you shouldn't take too much time. i. love. you. you just made my life. Hahaha that's wonderful to know! I'm glad I was able to help! !